It would be a gross generalization to say that all women "think like women" and all men "think like men," so does it matter whether your mentor is male or female? That depends. Women encounter a specific set of problems in the workforce more frequently than men do: discrimination based on gender and age and, even to some degree, discrimination based on their physical appearance. A female mentor is likely to have encountered some discrimination in the workplace and may be better able to tell you how to crack a male-dominated industry or how to deal with gender discrimination issues that a man has not had to deal with. However, women who isolate themselves in an all-woman environment are missing out on the male perspective, and, because the majority of the business world is male-dominated, it is important for all businesswomen to understand how to play the game to win. There are many women-helping-women organizations that have mentor programs, but if you already know a professional who might serve as a good mentor, approach the subject casually at first. Being a mentor can be time-consuming and is something that must work for both mentor and protégé. Before you ask someone to become your mentor make sure you are willing to take direction from them, otherwise you will just be wasting everyone’s time. Remember, you are looking for solutions, guidance, and concrete advice, not an executive to “wow” with how great your ideas are. If all your ideas are truly that great, you do not need a mentor—you should consider becoming one. To find a mentor in your industry, contact a professional association or call your local social or human services department to see if free mentor programs are available in your area. You can also register with Micromentor and see if they can match you with a volunteer mentor. The service is free, but the application takes about 30 minutes to complete online. 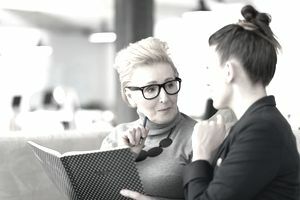 While it is helpful if you and your mentor get along on a personal level, a mentor’s role is to serve as your professional guide, not as a personal friend. It is critical that you be able to accept advice from a mentor and stay focused on the business aspect of the relationship, not the friendship aspect. It is much harder to do if you choose someone already close to you to be a mentor, especially if you see your mentor friend as a peer instead of as a professional resource to help you further your business interests. If you want to avoid conflict with your mentor, it is better to save friend and family resources for networking. That way, if the mentor relationship does not work out, you won't have to "fire" your friends.